As you all may know I ADORE glitter polishes even though they're a pain to remove! 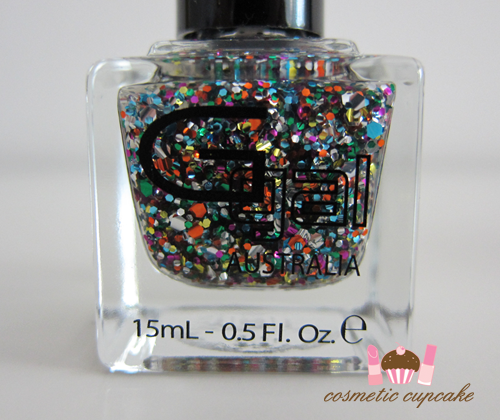 One can never have enough glitter I say so I was very excited to hear that one of my favourite Aussie brands Glitter Gal were releasing glitters to their range of polishes. 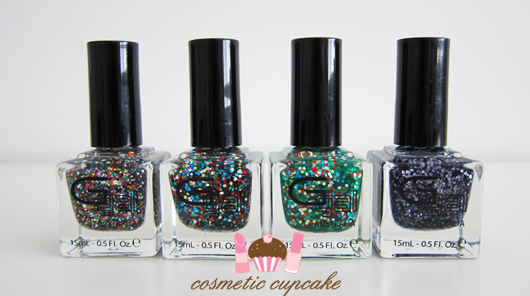 The Glitter Effects collection consists of 4 fun glitters and are Big 3 Free. I was so honored when Anna and Kerry asked me again to help swatch their new collection! They are super fun and I think you'll all enjoy them as much as I do =) WARNING: Picture heavy! Sabrina contains a combination of large and small silver, orange, blue, gold purple and green hex glitters suspended in a clear base. I love these colourful glitters so much! They're like a party on your nails LOL. 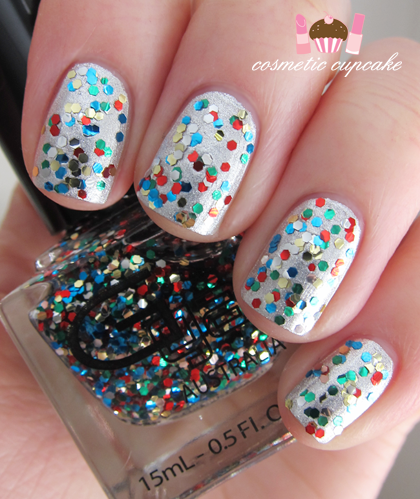 Sabrina is along the lines of OPI Rainbow Connection, Deborah Lippmann Happy Birthday, Milani Jewel FX Gems and Australis Fairy Bread. 2 coats is pictured over a silver foil. Imogen contains medium sized gold, silver, red, blue and green hex glitter suspended in a clear base. Whoa what a mouthful! This one is SO fun and reminds of clowns for some reason! I think it's all the bright colours together. 2 coats is pictured over a silver foil. 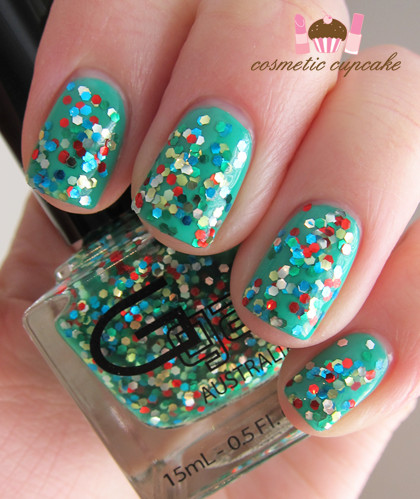 Rebecca contains the same coloured medium sized hex glitters as Imogen but it's suspended in a medium green base. I haven't come across many glitters in a green base so it's a bit different and lots of fun as well. 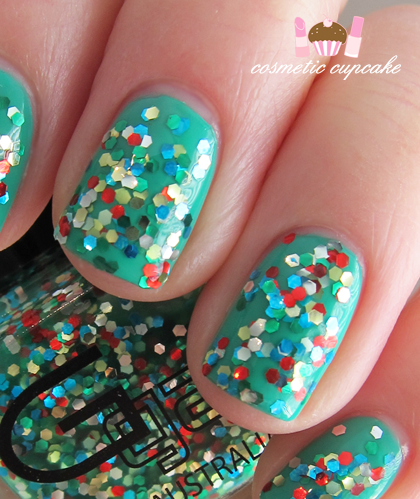 2 coats is pictured layered over 2 coats of Glitter Gal Neon Skater Girl Green (swatches to come!). Nicole contains large blue grey hex glitters suspended in a black base. The black base is quite sheer and gives a slight grey tint when you use Nicole on its own. 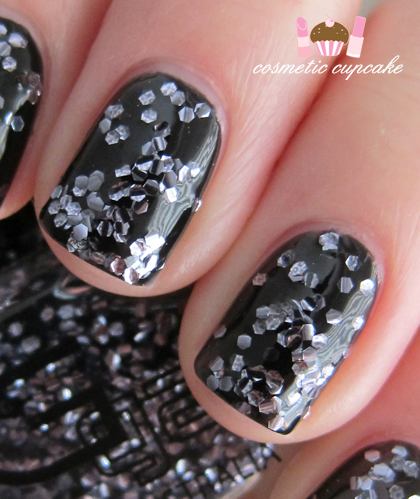 2 coats is pictured layered over 2 coats of my go to black Glitter Gal Serpent Black. 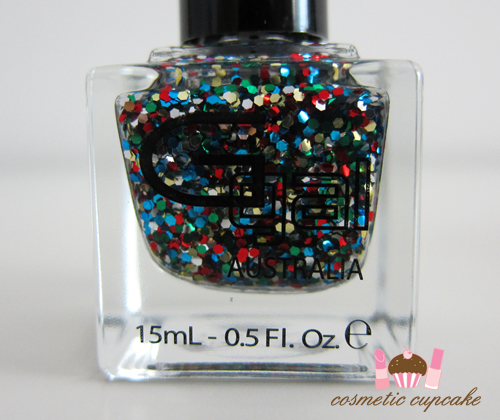 Overall: The Glitter Gal Glitter Effects Collection is fabulous! I am a massive fan of these larger glitters and Anna and Kerry have nailed these. 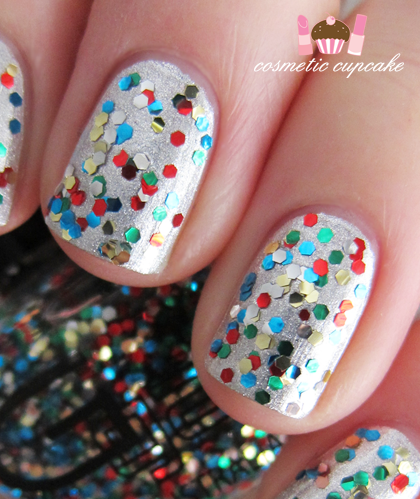 I love the variety of the polishes and the fun coloured glitters. They are so versatile and you can use them in so many ways! Layered over a base colour like I've done here, as a glitter gradient, jelly sandwich or on their own for a sheer look. The options are seriously endless and only limited by your imagination! I did a glitter gradient using Imogen and Crushed Ego and it turned out fantastic. I found coverage fairly even and I suggest taking your time and to allow each coat to dry thoroughly in between coats. Also I recommend using the "dabbing" method (or "splat" method as I like to call it haha!) to fill in any gaps you might get on the nail. Dry time was reasonable and the brush is great to use. The only downside to the Glitter Effects collection is unfortunately the inconsistency in the formulas. The formulas are on the thicker side and Imogen and Rebecca in particular were very thick and difficult to apply straight out of the bottle. 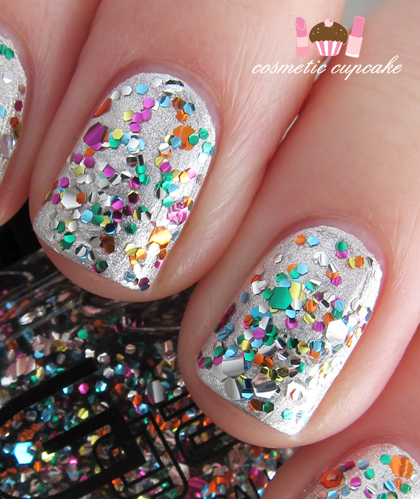 It may have to do with the fact that the polishes are SO densely packed with glitter! However a few drops of nail thinner (I used Seche Restore) did the trick and they were much easier to use. Nil issues after thinning them. 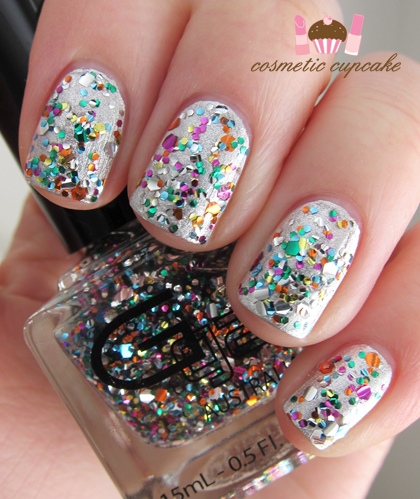 My favourite from the collection has to be Imogen - I just love the colour combination of the glitters! I've used it so much since receiving it I'm going to have to start rationing it lol. 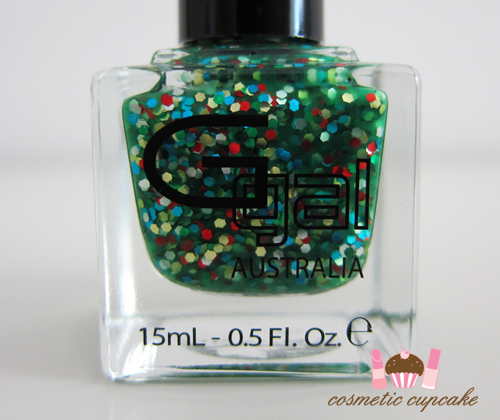 Details: The Glitter Gal Glitter collection is available now from glittergal.com.au and their stockists (full list here) for $14.95. 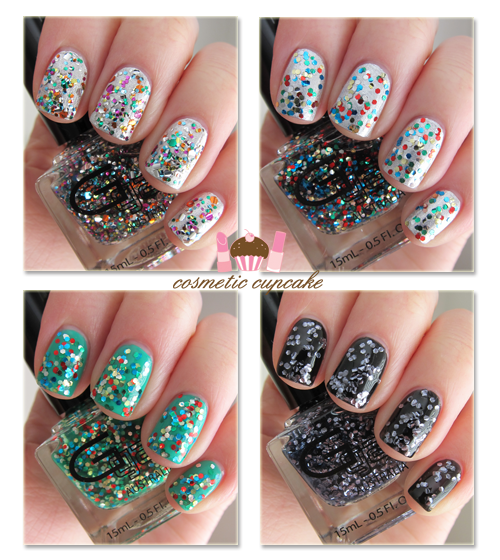 What do you think of these new glitters? Thanks for looking as always! Hmmmm, very cute and shiny. Oddly enough, I also really like the consistent size of the glitter in each polish - it seems special in contrast to all the indie glitters that typically have a variety of sizes. But in your pictures, it looks like a lot of the glitter are taco-curling. How were they for laying flat on the nail? With so many glitters on the market now, I don't feel comfortable spending so much money on curling glitters. I prefer even shaped glitters too. Even without topcoat these are really shiny! All dried completely flat except for Sabrina! The large hex glitters in Sabrina dry a teeny bit curled but it's nothing that a thick topcoat can't fix though. I can understand your hesitation don't worry. My pictures make it look more curled than it actually is in real life. Go figure! Sabrina and Imogen are super nice! They all look amazing! Great swatches! Glitters are not really my thing but if I was to go for one of these it would have to be Nicole. I had the same thought as Pookykabuki above. They do look curled. You're the 2nd person to say they look curled but they don't curl in real life! Some of the larger glitters in Sabrina curl a tiny bit but that's it, they all dried completely flat. Do take into account glare and that in my photos I get reflections from the room I take photos in! Glad you like the look of these Natalie! 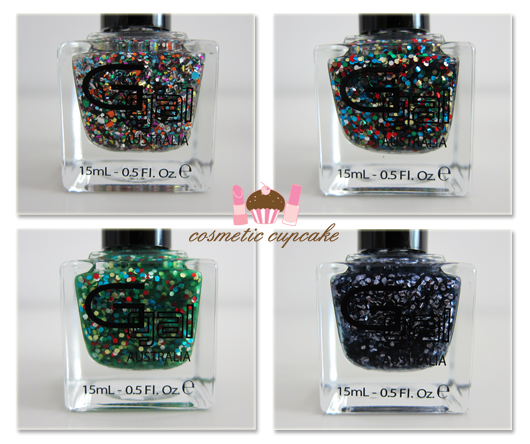 They do look like they taco-ed and honestly, I can't justify paying such a high price for those glitters when none of them look unique:/ GG used to justify their high prices by saying that they used special materials in their holos but these are just glitters. I love my glitters but I'm definitely passing on these. I'd have to disagree with you a bit there Nicole lol. I think apart from Sabrina (as this type of glitter has been done by so many companies) the others are pretty unique! My sister wasn't a huge fan of this collection either actually so don't worry xp to each their own! I think the market is too saturated by indie glitter brands these days that everyone has seen it all. The glitters don't taco actually. 2 or 3 of the larger hex pieces in Sabrina did a tiny but but the others all lie flat. I would have mentioned it in my post if they did ;) curling glitters annoy the crap out of me!! I think Nicole is the prettiest, nice to jazz up a dark mani with! O I really like Nicole. Sabrina is a little too crazy for me I think. The different sizes makes it more interesting but it's also very busy on the nails.